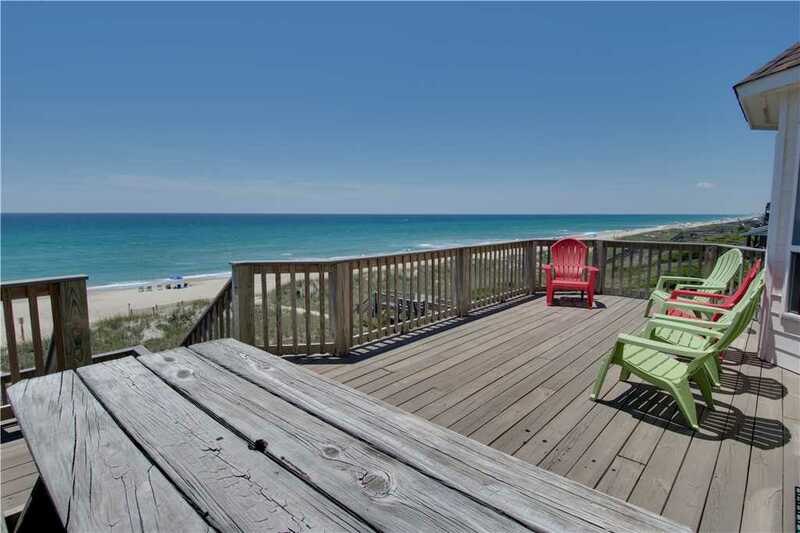 Living just steps away from the shoreline is definitely a lifestyle and is something that can be experienced at this week’s featured property, Vie Sur Mer II West. 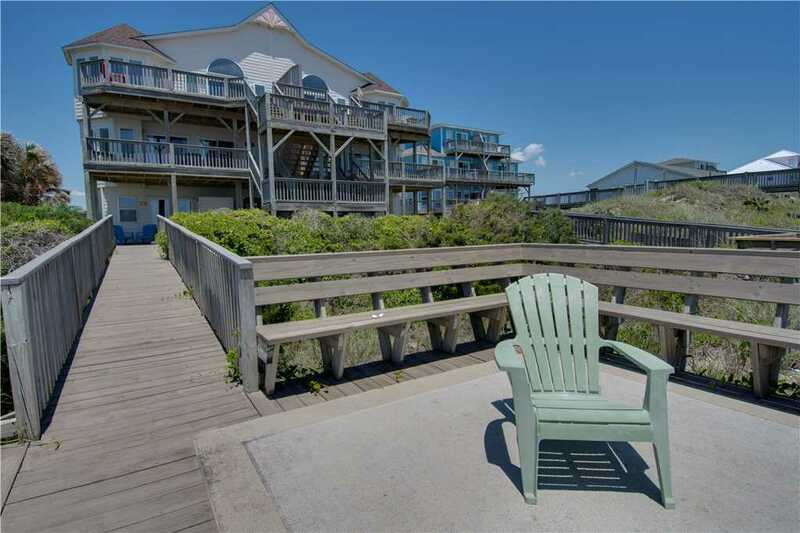 This three-story oceanfront duplex boasts five bedrooms, five bathrooms and unique architecture that make every corner of this rental property inviting and scenic. 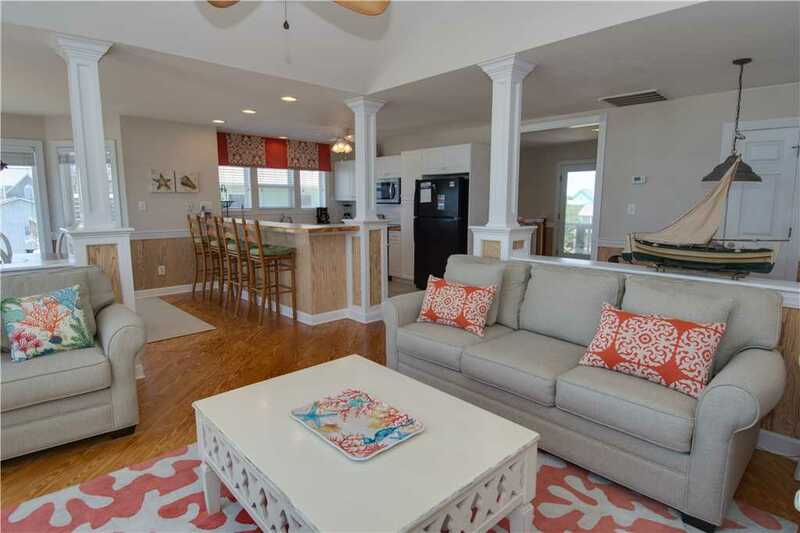 Be sure to check out more photos of Vie Sur Mer II West and see why this property was named after living a life by the sea. The top floor main living area is open and free-flowing from the living, dining room and kitchen. Warm hardwood floors connect the spaces and compliment the natural light coming in through the large picturesque windows. 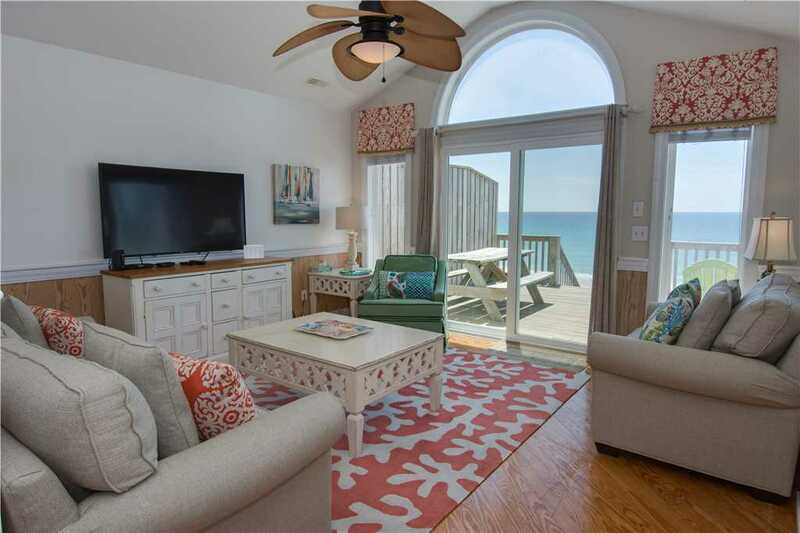 The ornate columns even provide a finishing touch of old oceanfront style to this stunning property. The living room is accented with coral colors that add a touch of coastal coziness to the love seats and lounge chair that are aimed towards a large wall-mounted flat screen TV. Off the living room is a round table with seating for four, which is perfect for breakfast or some serious game night competition. 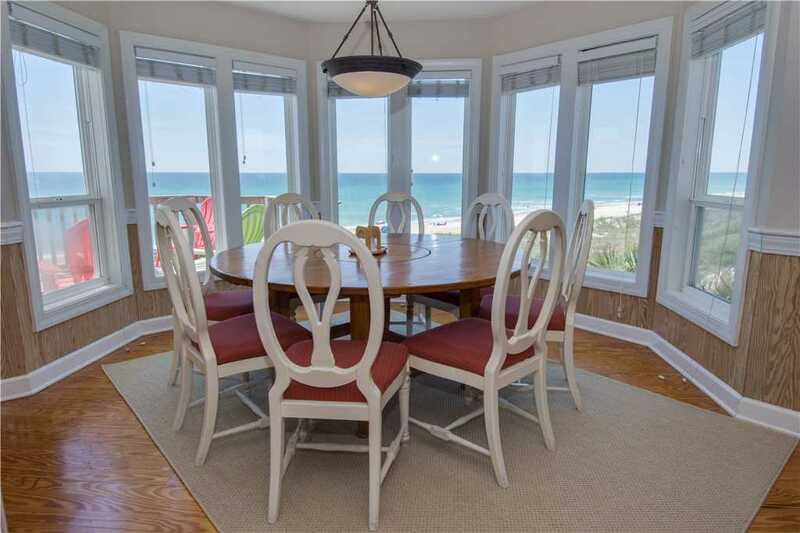 Another round table with seating for eight fits perfectly in the rounded dining room with large windows that provide extended panoramic views of the beach. 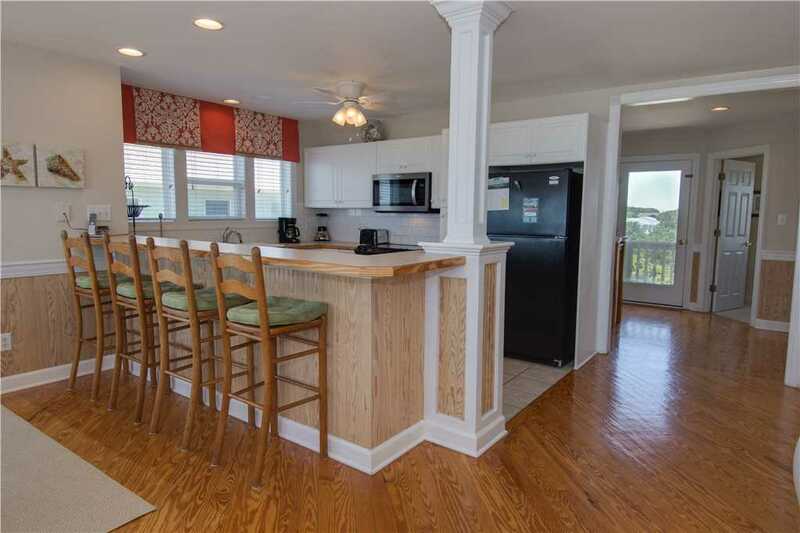 In the kitchen, you’ll find a bar with seating for four that is perfect for entertaining while preparing meals or enjoying each other’s company after a day by the water. On the ground floor, there is another common room that features a large plush couch, wall-mounted TV and a wet bar with mini-fridge so you can stock up on your favorite beverages and libations. 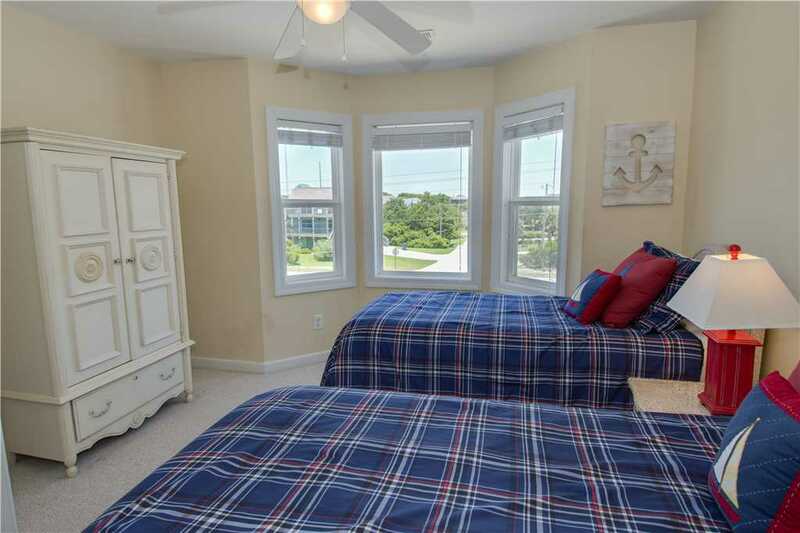 This room also has a sliding glass door that not only provides a great view of the beach but direct access to a boardwalk that will lead you to it.  There are five bedrooms at Vie Sur Mer II West, four with queen-size beds and one room with two twin-sized beds. 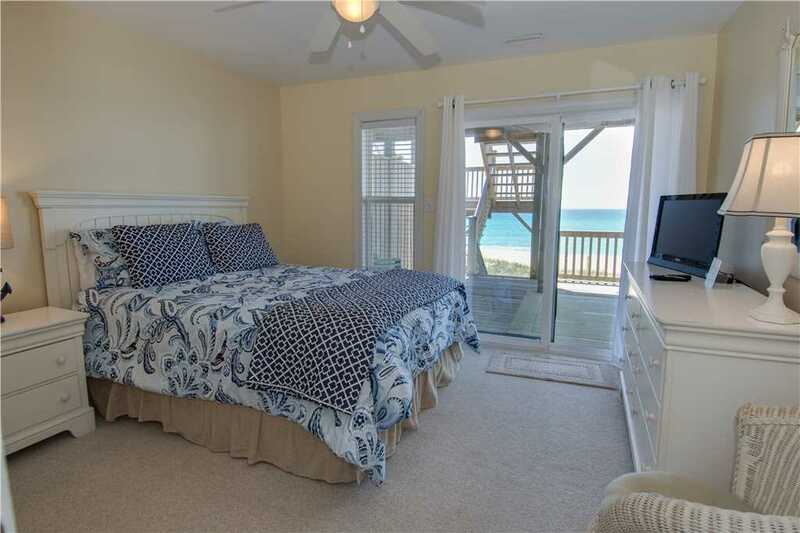 Two master bedroom suites have oceanfront views with sliding door access to the balconies on the second floor of the duplex. 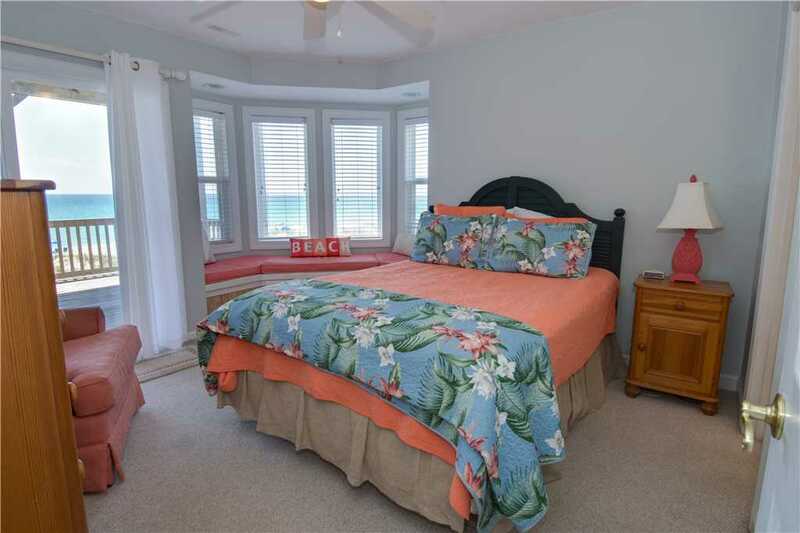 Each of the suites is decorated in a warm pink and light blue colored bedding which mimics tropical beach aesthetics. 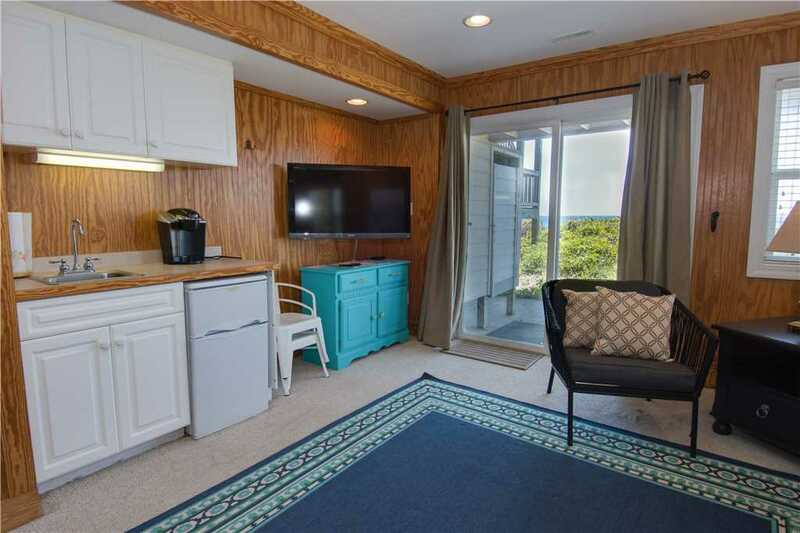 One of the suites also has a nook overlooking the beach. The master bedroom suites’ adjoining bathrooms are luxuriously appointed with plenty of space and jetted tubs for ultimate relaxation. Another bedroom also has a scenic nook and queen size bed. The room with the twin-sized beds is perfect for your younger guests and the ground floor common room has the last queen-sized bed. 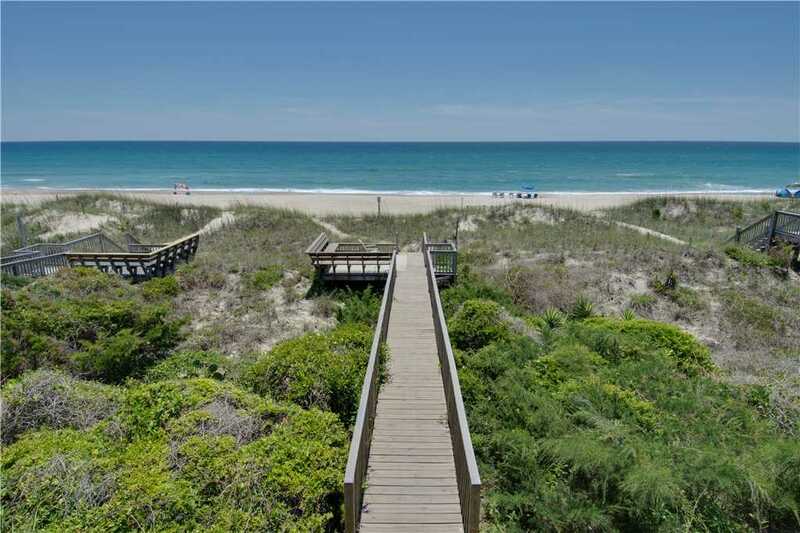 When you’re this close to the beach, the activities you can plan on your Emerald Isle vacation are almost endless. Even during the cooler winter months, there are plenty of beach activities to participate in from combing the sand for shells to walking up and down the shore to just take in the views. Take a look at some other reasons why a visit to Emerald Isle this winter might be just what you need. 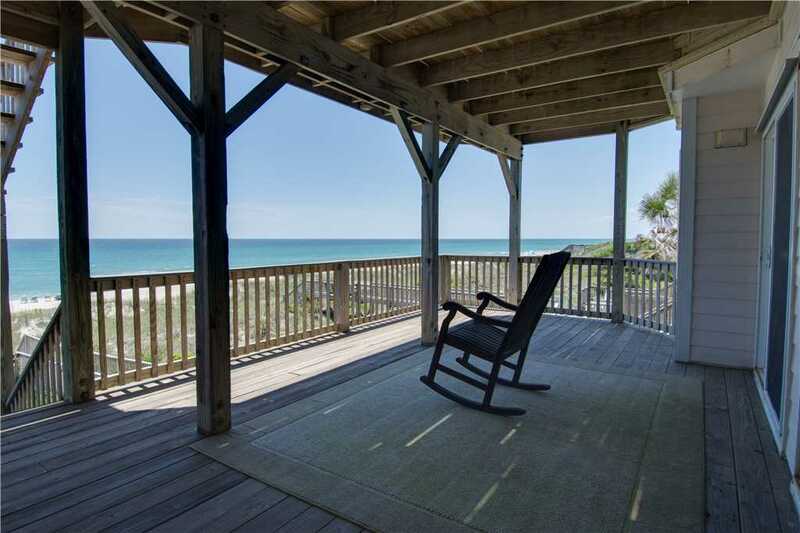 At Vie Sur Mer II West, the outdoor views are majestic from each of the three stories of this duplex and there are plenty of Adirondack style chairs to relax in and a picnic table on the top floor for meals with a view. And speaking of that meal with a view, why not make it Carolina style barbecue that you cook up on the gas grill? 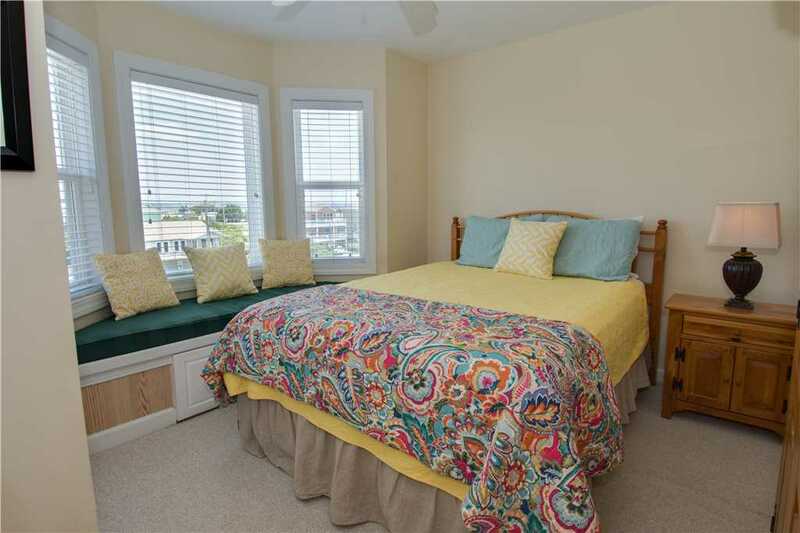 This duplex also is located in the heart of Emerald Isle and is close to local restaurants and shopping. Are you ready to live life by the sea? 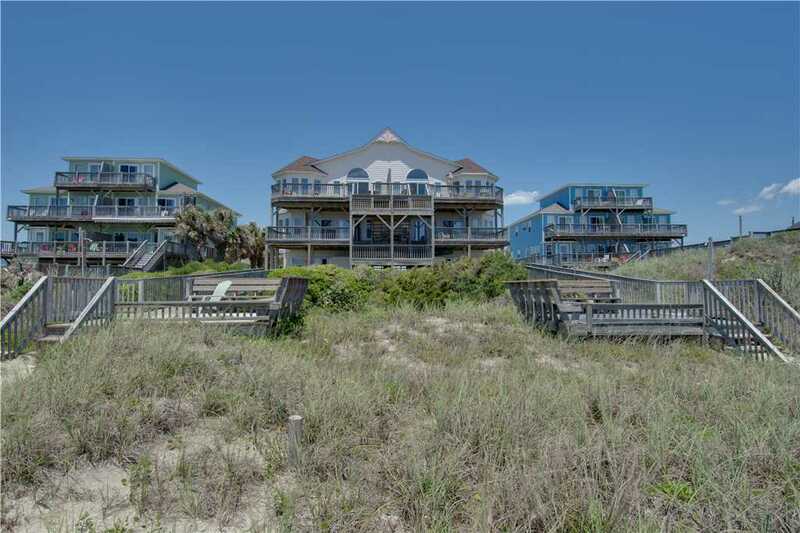 The Vie Sur Mer II West duplex is available weekly, all year round, and is part of Emerald Isle Realty’s Spring Savings Discount.